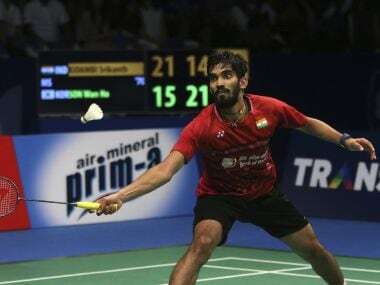 New Delhi: Riding on his performance at the Indonesia Super Series Premier last week, Indian ace Kidambi Srikanth improved 11 places to jump to the 11th spot in the latest BWF World ranking at New Delhi on Thursday. Srikanth, a former World No 3, clinched his second Super Series Premier event last week at Jakarta. He now has 51,603 points in his kitty. 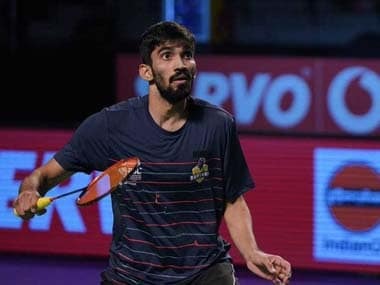 HS Prannoy, who stunned Malaysia's Lee Chong Wei and China's Chen Long in Indonesia to reach the semifinals, improved four places to reach a 21st spot. However, Ajay Jayaram and B Sai Praneeth slipped two places to take the 15th and 16th spots. In women's singles, Saina Nehwal and PV Sindhu lost one place each to slump to fourth and 16th positions respectively. Women's doubles pair of Ashwini Ponnappa and N Sikki Reddy improved two places to reach the 26th spot, while Sikki and Pranaav Jerry Chopra lost a place to be at 16th spot among Mixed doubles pairs.